Oliver has arrived! – Oliver est arrivé! 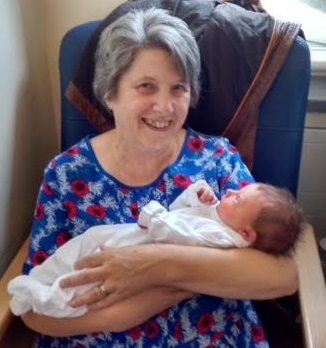 I am delighted to welcome my first grandchild Oliver, born on Thursday 16th July at 2.16am, weighing 7lb 6oz! Congratulations to mum and dad, Adam and Ally! Je suis ravie que mon premier petit enfant est arrivé jeudi 16 juillet à 2,16 am! Felicitations à Adam et Ally! This entry was posted in General by aiguilleanglaise. Bookmark the permalink. Congratulations! You will have so much fun being a grandma. Love his name! Félicitation Janet aux heureux parents et bienvenue à Oliver Tu vas être une grand-mère très heureuse avec ce beau petit garçon.